Please RSVP for this one! It will help to have an idea of how many people are coming. We also will have a few copies of a Unity development book to give away! We’ve had a lot of meetups at Philly GameWorks where we learn the mechanics of making games. We’ve created characters and controlled them as they run across our screens. We’ve learned to make 3D worlds with terrains, skyboxes, and environmental sounds. But you need a lot more to finish your game. A game has menus and on screen displays that show status and scores, you might want to display ads. And of course, you need to build the game for the various platforms you are going to support. Unity 4.6 New GUI Tools – We’ve been saying for awhile now: “When Unity 4.6 gets here, there will be all new tools to build your game’s user interface.” Well, Unity 4.6 is here! To follow along with this part of the evening, you will HAVE to have Unity 4.6. So get to the Unity download page and upgrade if you haven’t done so. 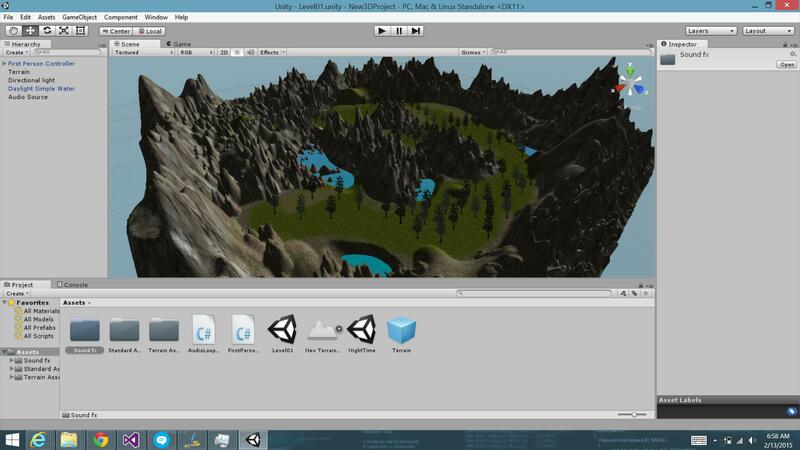 Last night at Philly GameWorks, we got a look at the Terrains feature in Unity. This allows you to sculpt worlds using the tools just within Unity. Using only built-in packs or free packs from the Asset Store, we created scenes and added first person style controls so that we could walk around our created worlds. Tonight we were fortunate to have Andrew Smith join us to show us how to build games that run in your web browser with PhaserJS. PhaserJS is a library optimized to run high performance games in desktop and mobile browsers. It provides a nice library that is game focused and game ready. 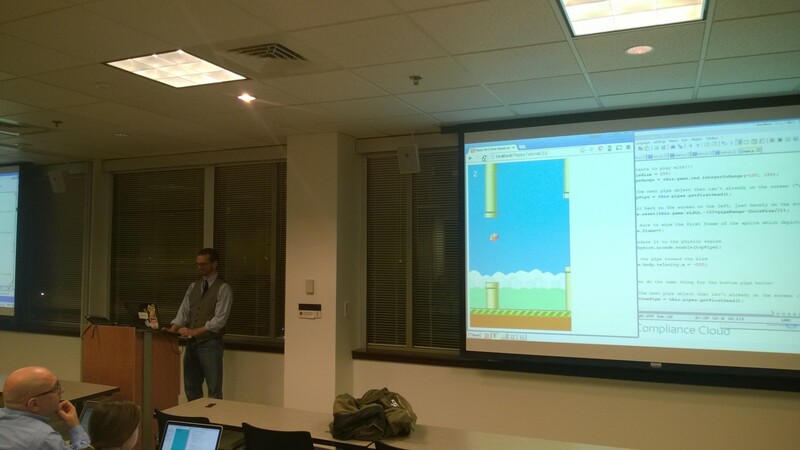 Andrew’s demonstration was building a Flappy Bird clone. Through the series of demos, we could see that PhaserJS gives you tools to display images or run animations of them (sprites and spritesheets) to make your main character look like it is flapping away. He detected spacebar presses to make the bird “flap”. Then he was able to easily detect if the game’s obstacles and your main bird character collided, so he could take action there (end the game) and show your score. If you missed it, you can learn a lot about PhaserJS just by downloading the files for tonight’s course. Andrew used the Apache web server distributed in XAMMP and simply unzipped and placed these files right in the XAMMP web server folder. Then we ran the demos in the browser and explored the code. Andrew is the Director of Developer Education for AgeCheq. AgeCheq’s API helps developers comply with US federal standards for verifying the age of your users. This keeps you from running afoul of the Children’s Online Privacy Protection Act (COPPA). It’s something an aspiring mobile developer needs to think about, since everyday we see parents handing their cell phones right over to very young kids to play their favorite games. Your users on a device aren’t always the owners! Our 2015 Schedule is coming together now and it looks exciting! First off in January we are going to hear from Andrew Smith, the Director of Developer Education at AgeCheq. He’s going to teach us how to use the great Phaser framework to make games that will work right in your browser. Phaser is also optimized for mobile browsers. But that’s not all. Andrew wants you developers to bring your kids and get them interested in programming. He is going to start from the very beginning of web development basics. There is no better way to get your kids excited about development than to ignite their passion for creating their own games (it’s what I did on my first PC). And as always we are reaching out to the rest of the Philadelphia game development community and we will be hearing from more game publishers so they can help us learn the art of finishing games. Come join us at Philly GameWorks in 2015 and get ready to publish your first game. As 2014 comes to a close, I wanted to say thanks to the enthusiastic and dedicated membership that has been supporting Philly GameWorks at the end of its first year. I approached Dave Voyles about starting this group because it was the “user group” I always wanted to go to myself. Thanks to Dave and Amanda Lange, we have the support of Microsoft providing us a space to meet in Malvern. I am grateful to have Microsoft’s support and especially the Technical Evangelist group that wants to help every one of us publish our first game. The Malvern office is ideally positioned to capture the development community that already comes out in support of Philly.Net. I also felt we could talk to other developers who have built a career in “line-of-business” programming but have wondered what the dark secrets of game programming are. I hope that in 2014 we provided a good introduction. In 2015 we will continue to look at tools and techniques, and I am very excited to see some interesting new directions we can go in thanks to the expertise of our own members. We also are talking with the game development community in Center City and I am thrilled that you will get to meet these awesome folks in 2015 as well. And in 2015, our shared New Year’s Resolution is to publish our first games. That means each and every one of us finishes and ships a game. There’s never been a better time to do this yourself or with a small team, so this is our shared goal. Let us help you and let us all work towards this goal! Don’t forget that Philadelphia has a thriving game development community. Check out the Dev Night link below. It’s highly recommended. And use a great program like One Game A Month to help keep your game ideas focused and small so you can meet your New Year’s resolution! It’s often easier to understand the ideas of 2D game graphics with sprites or spritesheets that contain frames of animation. But the world of 3D graphics is filled with lingo and scary sounding math. From vectors, matrices, vertices, and meshes to shaders, skinning, and tweening, this presentation is a primer on “How 3D Works” so that you can more easily understand the libraries, frameworks, and game creation tools that are throwing these terms at you. Come join us for a presentation about the “lingo” of 3D graphics that you will encounter in game engines like Unity, Unreal Engine, or in programming texts, blogs, and samples. This is a presentation where code is NOT the star. Instead, we want you to come away feeling comfortable that you can get started with great tools to build games and high performance graphics. We’ve studied various toolsets at Philly GameWorks. We’ve looked at the Unity Game Engine in depth, and spent a little time with MonoGame and GameMaker. In October, we’re looking at BabylonJS for games on the web. In November, we’re going to start by taking a look at an innovative game platform built for your Xbox One. Project Spark allows you to develop games with your Xbox One or Windows 8 PC using a game engine that is built right into the game, so to speak. You can build games with your Windows 8 PC and play them on your Xbox One. Or you can record animations of yourself moving, dancing, jumping, or running with your Kinect on Xbox One and apply them to the characters in the game you are building. The games are shared and rated among the Project Spark community. There’s no “programming” the way we think of programming languages, algorithms, or code. However, you can create logic for your game characters on-screen, so that the game’s characters respond the way you want to make the game you want. This is a perfect way to get the whole family involved in game development. If you have Windows 8 PCs, you can develop and play on those PCs. If you have an Xbox one, you can develop and play there. And if you have both, the games you make on one platform work on the other as well. Bring your Windows 8 laptops and get started with Project Spark at Philly GameWorks.